Each individual has to take several measures to get ready for winter. Similar to human beings, dogs also need to be prepared for the cold winter month. Along with setting up a warm and comfortable indoor spot for the animal, you also need to choose the right winter garments for the dog. The denim winter coat for dogs come in variety of styles, designs and colors. But you must not pick the winter garments only because of their aesthetic appeal. It is always important to consider a number of factors to ensure that the coat meets your dog’s specific needs. While buying winter coats for dogs, you need to ensure that it fits perfectly. You must avoid all types of guesswork, and use a measuring tape to measure the pet’s body perfectly. The dog’s body needs to be measures at four distinct locations. You can start by measuring from the pet’s collar to the base of his tail. Then you have to use the tape to measure his chest and upper back, along with his body’s widest part and the narrow section around his stomach. You must note these measurements accurately to buy the perfect winter coat. It is also a good idea to avail the assistance of your friend or relative, if you are new to measuring a dog’s body. The winter coats for dogs are available in a variety of styles, colors and fabrics. But you must remember that the wrong winter garment will distress the pet. So you must choose a fabric that perfectly complements the animal’s needs. At the same time, you also need to keep in mind the regular activities of the dog. For instance, if you are planning to take the dog on mountain climbing excursions, it becomes essential to choose a coat that is not tight enough to pull his fur. The dog coats further needs regular washing to remove dirt and stains. Therefore, you must opt for coats made of machine washable fabrics. You must keep in mind the chewing habits of your dog while picking a denim winter coat for him. If the animal is an avid chewer, he will chew the winter garment immediately. So you must understand how to choose a coat that your pet will hate to chew. Often winter coats tempt dog by sporting shiny buttons, fringe and fur. Also, you can consider avoiding the leather winter jackets. Often these chewable items temp dogs, and can also result in choking hazards after swallowing these. Many stores even offer specially designed winter coats that will not temp dogs to chew the garments. 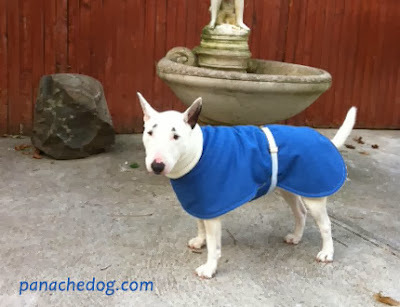 You have option to buy the winter dog coat from the local as well as online stores. Many people prefer buying winter clothes for dogs online to save both time and effort. But you must choose the denim winter coat from a reliable web store to keep your pet warm comfortable throughout the winter months.